Want to learn to play guitar? All it takes is One Note. Whether you want to jam with your friends or simply learn to play your favorite songs, The One Note Guitar Method can help you to both learn and teach others. This method of instruction is a simple-yet-powerful tool created by Corey Michael Baker, a long-time guitar, bass and mandolin teacher. Corey has taken 17 years to develop this unique form of ear training, and now his proven system is available to anyone interested in learning to play the guitar. The One Note Guitar Method is surprisingly simple: Once students learn to recognize one note in any song, they’re able to play the entire piece. And, once students learn the fundamental music theory behind One Note, they’re able to play any number of songs quickly and easily. 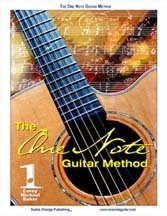 See for yourself; open a few pages of The One Note Guitar Method. Interested in guitar Lessons in the Cedar Rapids, Iowa area?, call us at: 319-861-2958. Record with Corey: In Iowa any time soon? Learn more about recording with Corey at The Bakery Recording Studio. Learn to communicate musically! The One Note Guitar Method can get you there!